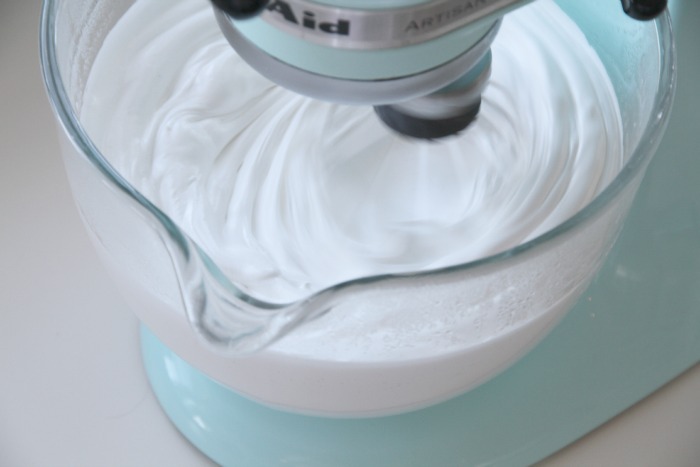 This frosting is super yummy and perfect for both cupcakes and layer cakes. 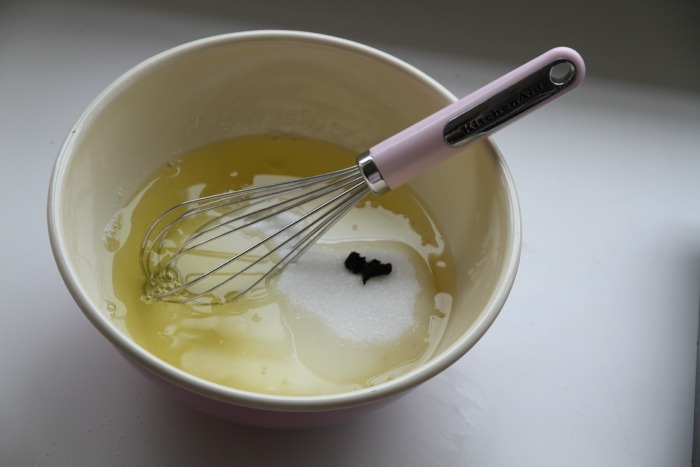 Put the egg whites, sugar and seeds from the vanilla bean into a large bowl. Place the bowl over a saucepan of simmering water. 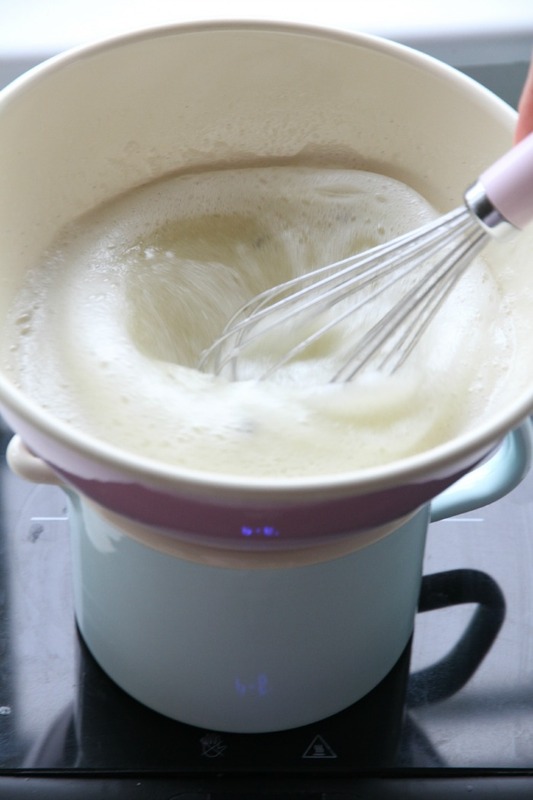 Whisk by hand for about 4 minutes, or until the sugar has dissolved. 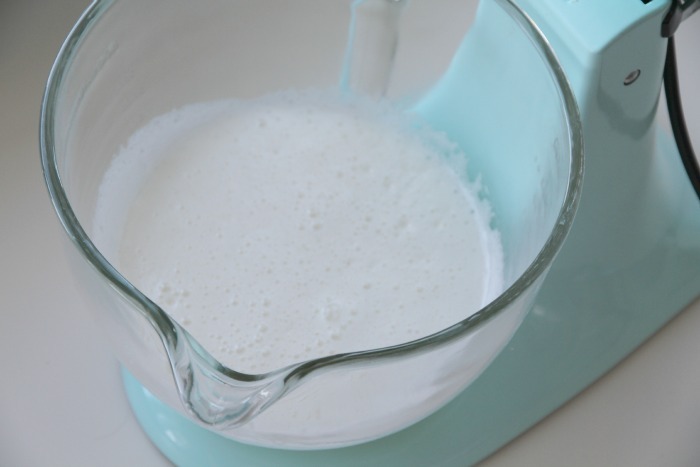 Transfer the mixture to the bowl of a freestanding electric mixer and beat on low speed for about 4 minutes. Increase the speed and mix for another 3 minutes, or until the bowl no longer feels warm to the touch. 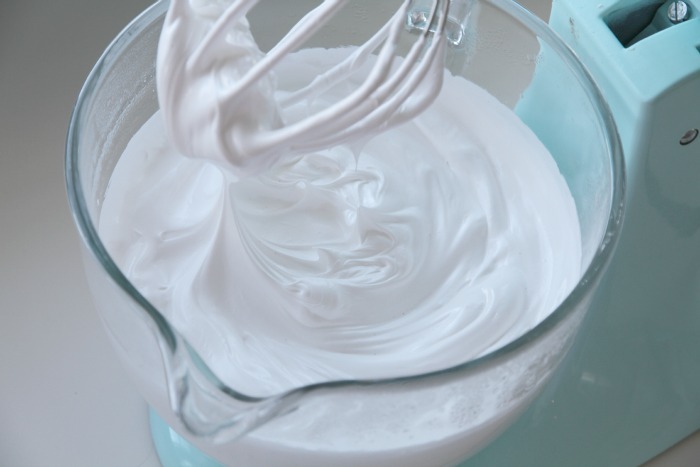 If you want the frosting to have a lovely pastel shade, add a drop or two of food coloring and mix for another minute. Hello, I would like to know the size of the eggs you used for this recipes, M, L or XL? Hi Claudia, the eggs used here are large. Hei! Jeg har laget denne frostingen flere ganger! Smaken er himmelsk men jeg har ett problem! Det er at når jeg slutter å piske synker kremen sammen og det går ikke an å pynte noe med den! Hei Inger, etter det du beskriver så høres det ut som at det har kommet med bittelitt fra en eggeplomme, eller at bollen du bruker har hatt noe fett eller vann i seg. Det er veldig viktig at ikke en eneste dråpe med eggegule lurer seg med, og at bollen er veldig godt vasket og tørket. Bruk Zalo eller tilsvarende for å løse opp alt fett fra tidligere bruk, du kan også for sikkerhets skyld gni innsiden av bollen med en avskåret sitronbit da syren bryter ned eventuelt resterende fett. Hi Nidah, yes this frosting pipes well, and it will hold its shape on a cupcake for 5 hours if kept in a cool place. Hi, what can I use to replace the vanilla beans? I can’t find them in my country. 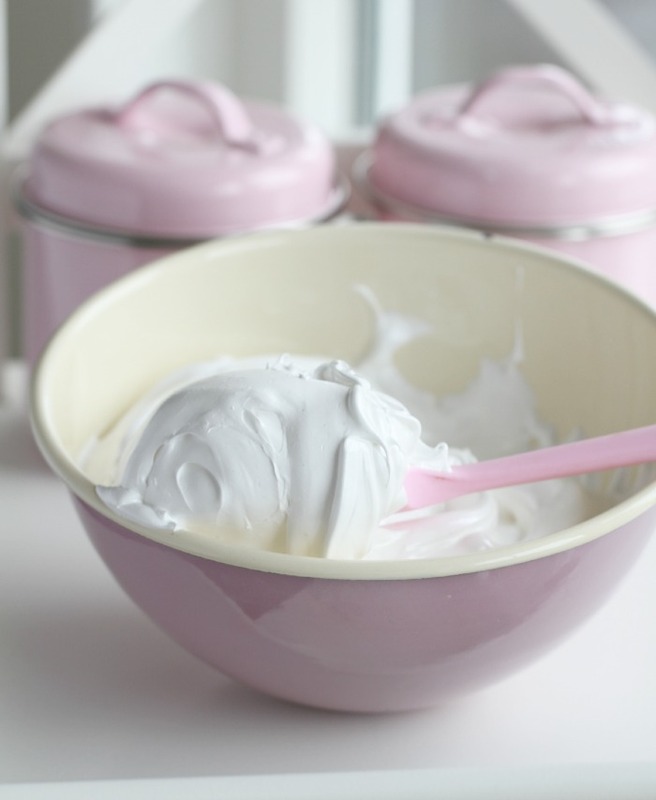 Hi Marie, you can use vanilla paste or extract instead, but if you do – add it at the end instead. These look amazing..but will the frosting have egg taste? Can i mix in strawberry extract or jam to get a strawberry taste in the frosting? 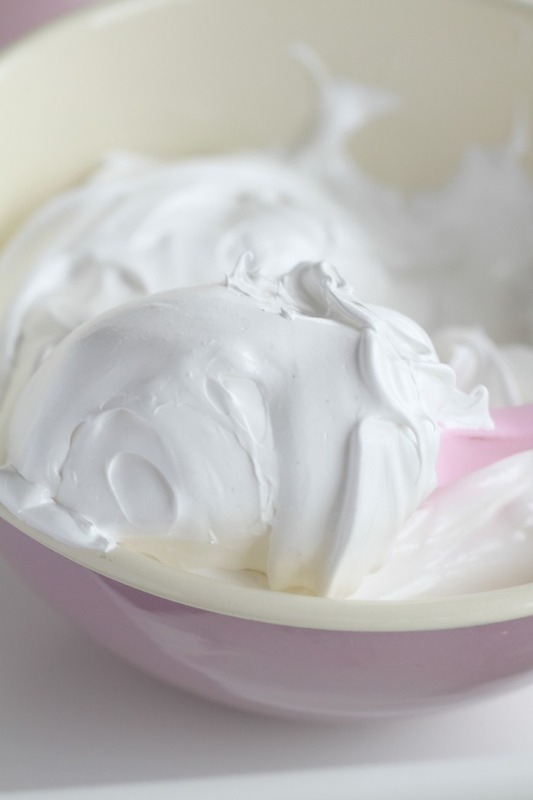 Hi Amira, the frosting will taste like soft vanilla meringue. You can mix in a few drops of strawberry extract, but we don’t recommend mixing in jam as this may make the frosting runny. Hi! I was wondering how much egg whites I should use if I buy a carton of egg whites instead of separating the whites from 7 eggs? I just don’t want to have to throw away 7 yolks!!! Thanks! 🙂 this looks delicious. Hi Ashley, you could use the yolks to make a delicious crème pâtissière or lemon curd, you can find the recipes here on passionforbaking.com. 🙂 That being said, one egg white is approximately 40 grams, so you’ll need about 280 grams egg whites (7 egg whites x 40 grams) for this recipe. If i replace the vanilla bean for vanilla extract, how much extract should I use? Hi Linda, the frosting needs a fait bit of sugar to get that consistency, but you may be able to get a good result using less than stated. 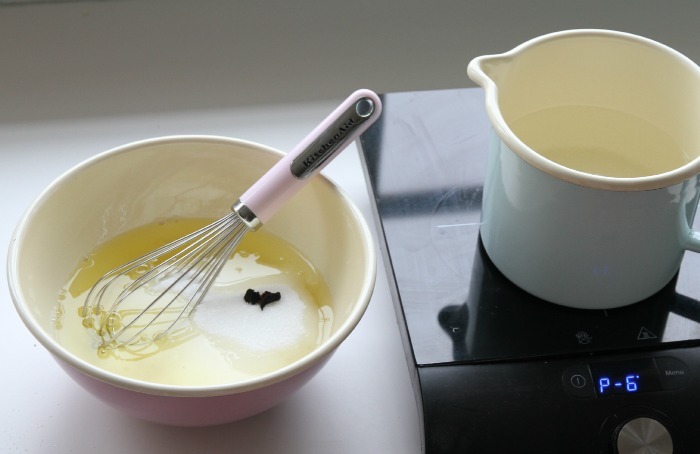 Lemon juice or zest can be added, 1 tablespoon of lemon juice gives the frosting a nice “tang”. Good luck! I ve discovered your blog 2 weeks ago and i m already a huge fan of you! I made this recipe today and the frosting turned out so super glossy and shiny and tasted so good! Thank you for sharing with us your recipes! You are the best! Kisses and hugs! I tried this but as it was mixing it stayed a liquid. Didn’t form at all ???? Hi Manuela , please could you advise what size eggs you use for this recipe. I buy egg whites in a box, you can use large eggs and take the eggwhites!